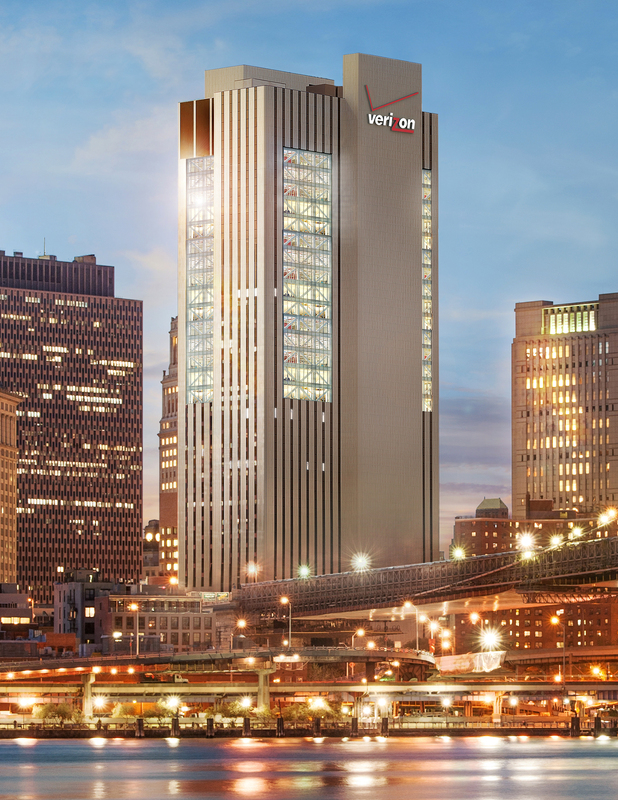 The monolithic former Verizon building at 375 Pearl Street is finally getting an upgrade. 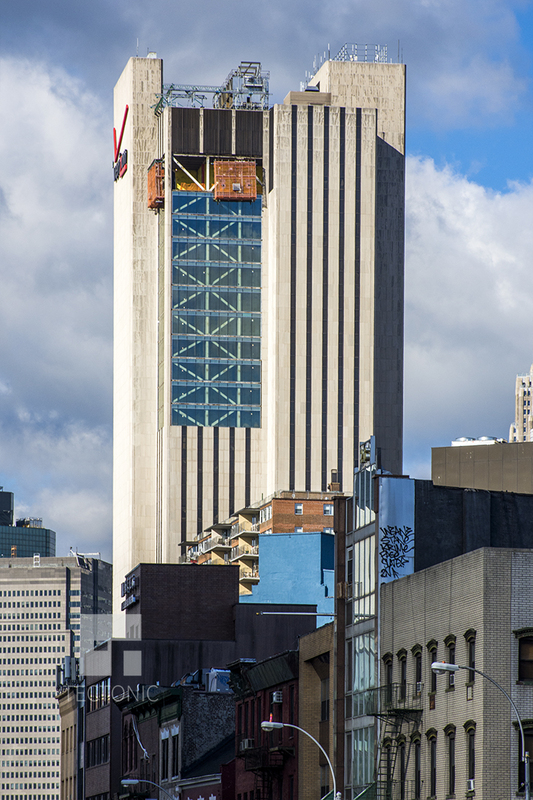 The 32-story telephone switching building is still outfitted with tiny, three-foot-wide windows, but big pieces of the upper floors have been removed and replaced with glass. Photographer Tectonic recently swung by to document the progress. While this renovation hasn’t pleased most New Yorkers—who say the 1.1 million-square-foot structure is one of the city’s ugliest—it does make the limestone facade a little easier on the eyes. 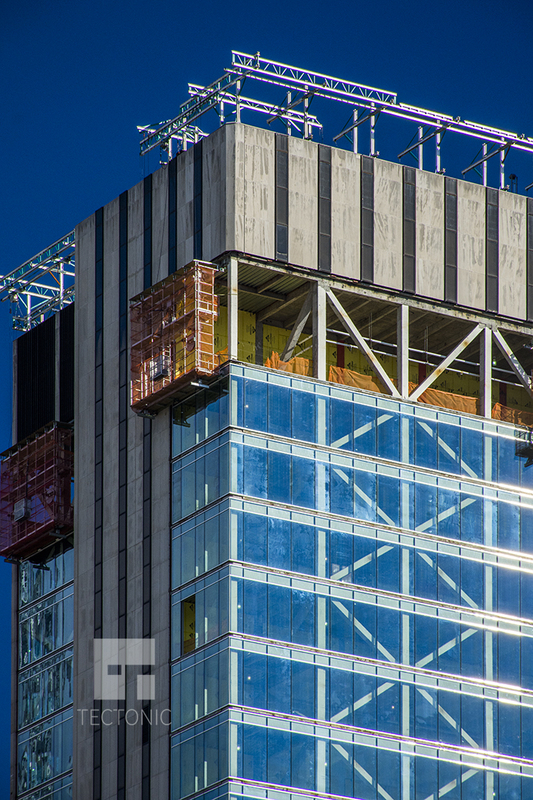 Most of the new floor-to-ceiling glass curtain wall has been installed, and now we can imagine the property’s future as an office building. Taconic Partners picked up the building for $172 million in 2007, and then Sabey Data Centers and Young Woo and Associates purchased a controlling interest in the property for $120 million four years later. A handful of city agencies have signed on as tenants in the past year. The NYPD is leasing 18,000 square feet on the 32nd floor, the Post’s Lois Weiss reported last year, and the Department of Finance inked a deal for 175,000 square feet of office space a few months ago. Transit Wireless, the firm responsible for installing wi-fi and cell service in 279 of the city’s subway stations, also has a 15-year lease in the building. 375 Pearl “provides access to an enormous energy and cooling system for Transit Wireless’ computers,” according to the Commercial Observer. Asking rents there hover around $43 a square foot. The 540-foot-tall tower, which sits at the foot of the Brooklyn Bridge, was constructed in 1975 and designed by architecture and engineering firm Rose, Beaton, and Rose. 9 Comments on "Former Verizon Building at 375 Pearl Street Gets a New Look"
Who say an ugliest structure?..shut up right now and straight to a new look of decoration. Why didn’t they do this to the building all around. The glass doesn’t work with the brutalist style of the building. Are they going to take down the Verizon Sign? 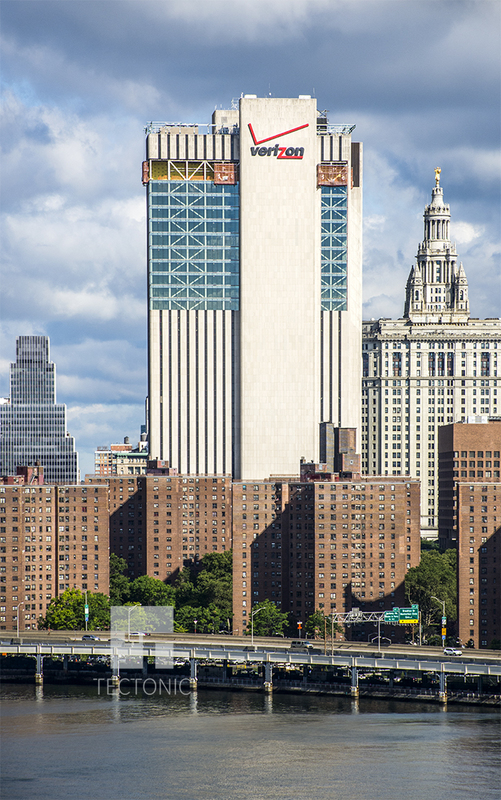 It certainly doesn’t improve the look of the tower–I think it’s actually worse. It’s still horrible. May the architect engineers’ names be swept into the dustbin of architectural history. 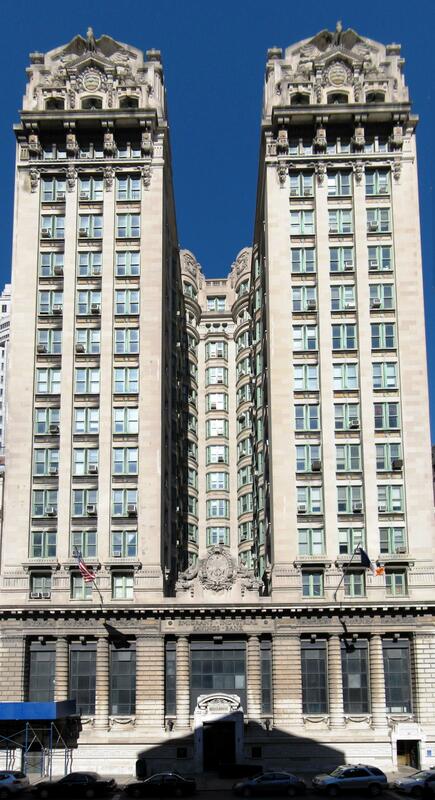 Will a similar renovation happen to the real ugliest building in NYC: the telephone exchange at Church & Worth Sts.? Also, is anyone watching the City lease portfolio expanding in some very pricey real estate. Hello, City Council. Is anyone awake there? I walked the Brooklyn Bridge (to work) for 30 years. This building was the worst thing I saw. 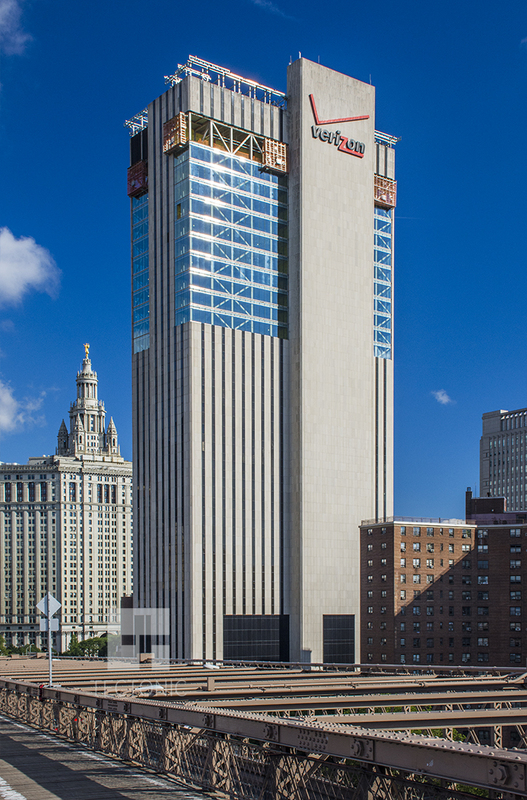 I could never imagine, who, in their right mind, would design such an ugly building. It should have been stripped to its steel and rebuilt…or torn down for scrap. Hope they glass all the way up and down the building, eventually. If you compare the rendering from January with the reality of today, it seems that the somebody decided to glaze only 10 floors as opposed to the original 14 floors that were to receive big windows. Those four floors would have helped with the proportions.